Gaining access to these closely-watched vessels is a privilege given to a chosen few. Fellow photographer and friend, Amy Heiden, was one of those few – and her recent story about visiting one of the ships (the AS-32 U.S.S. Holland, a 1960s-era Hunley-class submarine tender) is recounted in vivid detail on her website. The U.S.S. Holland in Spain - Courtesy USSHolland.org, via Amy Heiden. Later, as Amy follows a cadre of experienced mothball aficionados inside the Holland, she is showna gigantic cargo hold that vertically spans the entire keel of the ship. According to the interview she conducted with a former crew member, the space she saw once held the radioactive waste-water of nuclear-armed submarines. Of course (we can only hope! 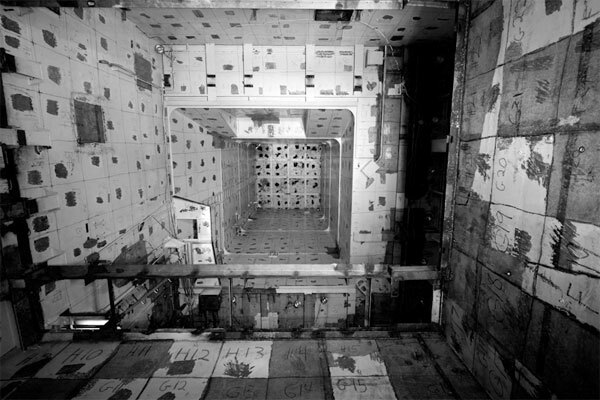 ), Amy arrived in this space long after its cleanup rendered it safe to explore. Amy’s experience is just one of many she’s had. In all she’s taken nearly a half-dozen journeys out to the mothball fleet. And her important documentation couldn’t have come at a better time. The Obama administration – rightly so – has made the removal and dismantling of the toxic ships a top environmental priority. 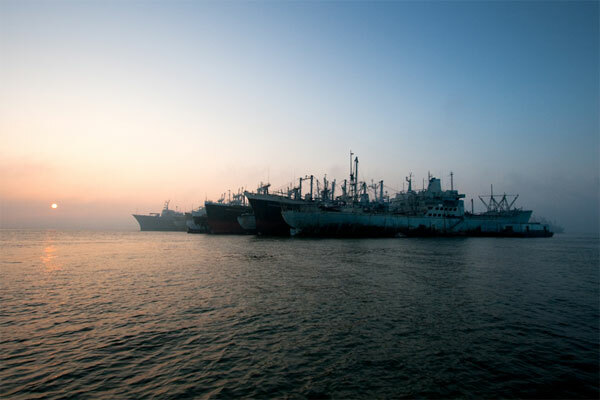 As a result, MARAD is scrambling to find suitable shipyards that will recycle the ships in the most environmentally benign manner. In the last few months, two of the ships that the Suisun Bay fleet hosted have been cleaned and exported to the shipyards in Texas. It’s likely that – soon – Mare Island Naval Shipyard (an abandoned and mothballed naval shipyard in and of itself) will be another facility equipped for handling this delicate and important task. 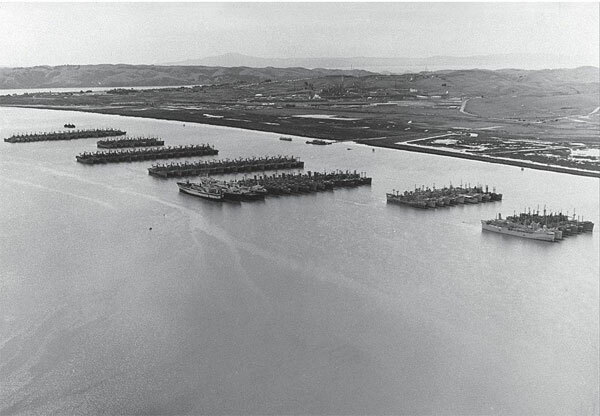 This image - generously provided through the exhaustive research of Amy, and courtesy of MARAD - shows the Naval Defense Reserve Fleet (NDRF) in the 1950s, when 400 ships were moored along the shores of Suisun Bay. At one point soon after the second World War, the NDRF fleet held 2,277 ships. Today, that number has dwindled to 230 ships (between 2003 and 2007 alone, 44 ships were removed from the fleet). I’m honored to know someone who has taken up the important task of documenting these relics of history before they’re gone forever. I hope you will take a look at Amy’s story. Do browse around, too, if you have the inclination; Amy’s dedication to photographing the pieces of the past extends far beyond the fascinating journey she narrates in her story about the Holland – nay, even her trips to the NDRF. This entry was posted on Tuesday, February 16th, 2010 at 7:49 am	and is filed under Built Environment, Geography in the Media, Geotagged, History, Military. You can follow any responses to this entry through the RSS 2.0 feed. You can skip to the end and leave a response. Pinging is currently not allowed. Great post and thanks for the link to Amy Heiden’s blog! Wow, this is so amazing. Nice follow up with the KQED site map. I really liked that you had another explorer give her story as well. Truly amazing! @Adam: Amy’s blog is a magical tome of exploration goodness. Be sure to subscribe. Amazing! I served on the Holland for 4 years…from Rota Spain to Bremerton Washington…then back overseas to Holy Loch Scotland. And after all these years she is moved just 20 miles from my home in Napa! Does anyone know if there where any radcon or other exposures to chemicals on the Holland during 75 – 77? Hi Kevin, I worked in radcon from 75 to 77. Worked on the first two steam generator inspection and repairs onboard subs in reactor compartment. Not sure what you mean about “exposure?” There was plenty of “hot” stuff on the Holland. Don’t recall any exposure problems. Served on the Holland in Holy Loch, was a radioman, enjoyed the ship, and Scotland a lot, sad to see her laid up. Hello all hope you all had a great Thnanksgiving 11/23/17. I was on USS Holland AS 32 from 20 November 1975 to October 1976 in Holly Loch. Very fine Ship then and regret the to see the Submarine force reduced to Razor Blades. Was on Commision Crew for AS 34 USS Canopus back in 1965. Watch a Posting or Her being cut up in England very distrubing site. 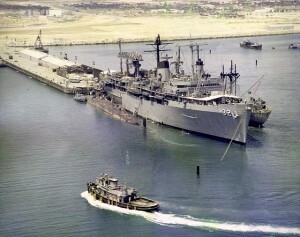 I served on USS HOLLAND (AS-32) from August 1971 until December of 1974. I worked as a Personnelman in the ship’s Personnel Office and in the Chaplain’s Office. Was on HOLLAND in Rota, Spain, Charleston, S.C., and in Bremerton, Washington.